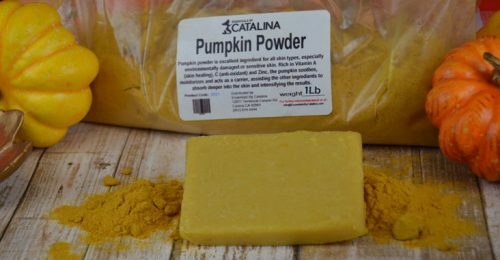 Preparing pumpkin products for autumn a month ahead of time is crucial, especially if you make cold process soap. 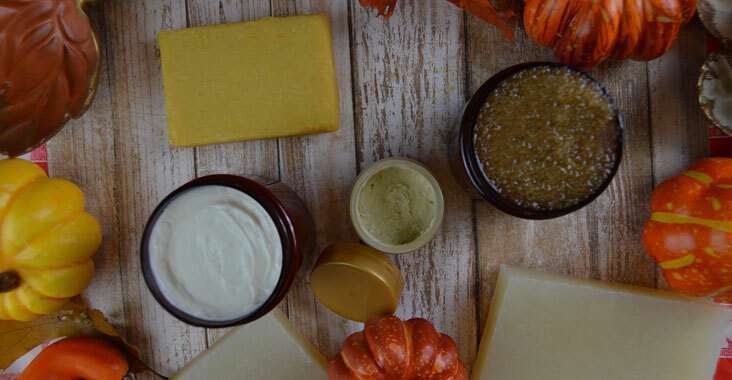 Here are several product ideas using our pumpkin bases and additives, perfect for your fall lineup. These bases contain extra virgin organic pumpkin seed oil. 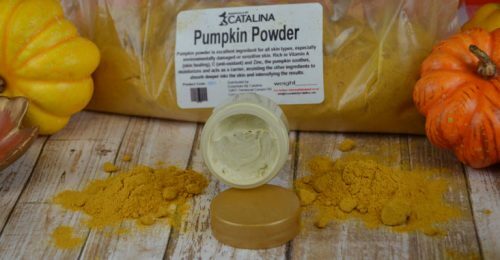 You can also use pumpkin powder in many of our stock bases such as the Hydra-M Face Mask. Preparing early for the festive fall season autumn will put your company ahead of the game by meeting the inevitable demand for pumpkin spice goodies! Pumpkin in any form is a great ingredient to work with. Wheather it is used for baking or using in personal care products, pumpkin has so many components that are useful. The dried, ground powder is a great natural exfoliate and the seed oil is a great moisturizer, both, rich in antioxidants. Pumpkin Body custard made with organic pumpkin seed oil. 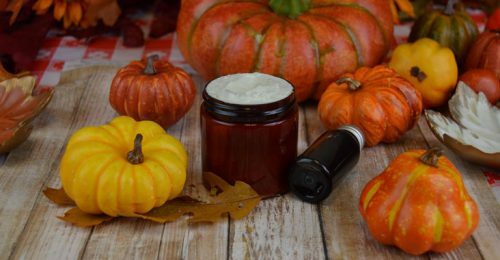 Our Pumpkin Body Custard base is creamy and thick, so it is perfect for skin affected by dry autumn air. Though the base contains pumpkin seed oil, it is not scented; you can scent it with any pumpkin inspired fragrance you choose or any fragrance for that matter. And, you can roll this product well into the winter. Pumpkin seed oil is great for the skin all year round. Add Pumpkin Seed Butter to your favorite cold process soap recipe. And also add some pumpkin powder to the batter. However, if you soap at high temperatures, the soap may gel. So soaping at low temperatures should keep the pumpkin stable. Just look at the scrubby goodness. The newest addition to our scrub lineup is the Pumpkin Sugar Scrub. It is made with organic turbinado sugar and organic pumpkin seed oil. The grain is coarse, giving it a massaging effect. So it makes for a wonderful relaxing all over body scrub. And since pumpkin seed oil is a lighter oil, it doesn’t leave the skin feeling greasy. This soap base is made with organic pumpkin seed oil and a blend of other synergetic oils. This base is easy to work with, the sky is the limit when it comes to creating cool products with this soap base. 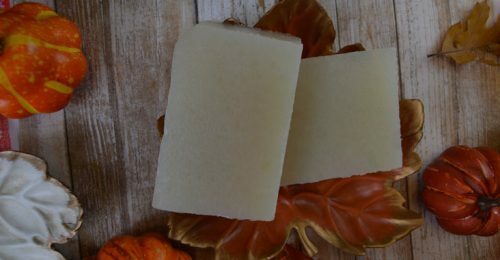 Add pumpkin powder to make a pumpkin-lovers soap. Or fill it into fall leaf-shaped molds for a festive fall soap. And since this soap is harder than the regular glycerine soap base, it works great embeds in cold process soap. Mud masks are in, and our Hydra-M Face Mask is the perfect mud mask base! It can handle an array of ingredients, including pumpkin powder. 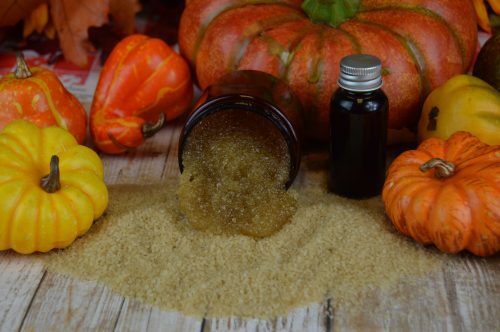 Not only is the pumpkin powder is perfect for an exfoliating face mask, but it gives the face mask a fresh cut pumpkin smell without adding fragrance oil. Add up to 5% pumpkin powder, however, I find 3% works best. When mixing the powder into the face mask, use a standing mixer. Also, for a smooth, aesthetically pleasing result, make sure you have mixed thoroughly, leaving no lumps of powder.